LLIPA project is constituted of two mining concessions: The Prospera mine and La Prospera XXI. 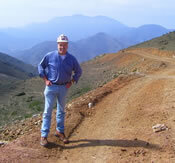 The mine follows the NW Mineralization Trend along with 2 poly-metallic mines: Antamina and Cerro de Pasco. Antamina mine is a joint venture between Noranda, TeckCominco, BHP Billiton and the Mitsubishi Corp. Antamina is rich in gold, silver, copper and zinc, with mineral reserves of 501Mt. Antamina has a production capacity of 70,000 tonnes/day and is the largest single-circuit milling operation in the world. Cerro de Pasco is an open pit mine owned by Volcan, covering over 61,000 hectares of poly-metallic mineral deposits. LLIPA is located in between Antamina and Cerro de Pasco and shows a strong potential for becoming a major poly-metallic open pit mine. The mine was previously in production and had already produced 1 million tons of tailings containing copper, gold, silver, and zinc which currently remain on the property.